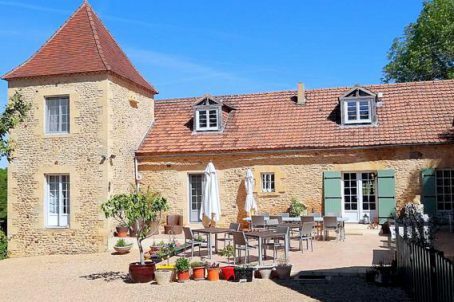 A remodelled farm of 1800 in typical local style, located close to Perigueux & Bergerac. The current owners have been running it for 15 years and now looking to retire. This nice property is on 20.000 m2 plot surrounded by forest and nature. The main house has 3 large bedrooms en-suite, a private owners bedroom en-suite, dining room, 2 salons and a semi-professional kitchen. There is central heating , easy to maintain windows in pvc with double glazing. In the annex building (which was a place to dry Tabaco) there are 2 more bedrooms en-suite, and electrical hearting. Outside there is a large terrace, where dinner is also served in the summer. A large heated pool of 10,2m by 5.2m with sun terrace. There is also a petanque & table tennis. There is another annex building with entrance from the main kitchen, used as storage, freezers, etc..